The KTM Komuter has been consistently contributing to the train route map in Malaysia. It was established in 1995 to provide a convenient local rail service throughout Kuala Lumpur and surrounding areas of the Klang Valley. Since then, the KTM Komuter service has been an indispensable part of the Klang Valley public transportation system. A significant addition to the train route map in Malaysia, the KTM Komuter has been reliably serving millions of passengers every year. The KTM Komuter route map is comprised of two main lines which are the Seremban and the Port Klang Line. These two lines provide a comprehensive coverage on areas in the Klang Valley. While having a significantly lesser coverage during its early years, the KTM Komuter route map has expanded to facilitate the rapid growth and development in the Klang Valley. While both lines serve primarily different regions in the Klang Valley, there are four major interchange stations available so that passengers are able to gain extensive access to all locations. 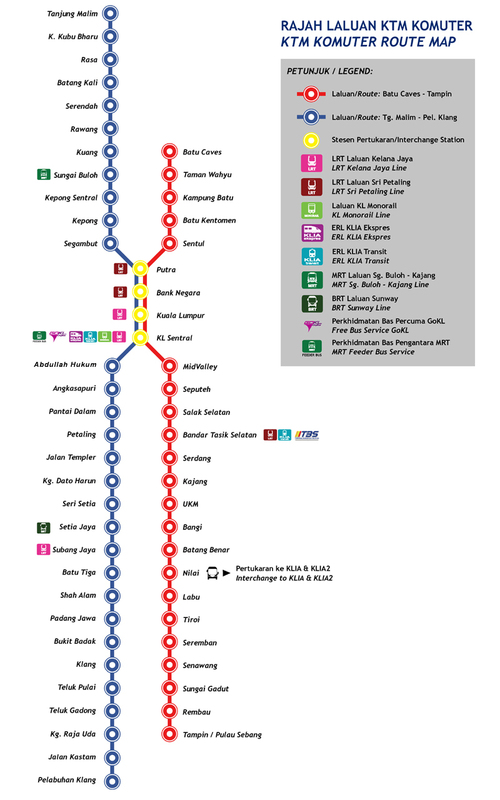 These are the Putra, Bank Negara, Kuala Lumpur and KL Sentral Stations. One notable fact is that the KL Sentral Station is the primary transportation hub where passengers can gain easy access to other public transport lines. 2018 All Rights Reserved KTM Berhad, KTM Berhad shall not be liable for any loss or damage caused by the usage of any information obtained from this site.